During the coast out to the Moon, the crews lived in the command module to preserve the LM's consumables. At least once during the coast, they took time to open up the tunnel between the two spacecraft and make a preliminary inspection of the lander. No one had seen the inside of the LM since it was on the launch pad and no one knew how well it had survived the rigours of launch. As Armstrong and Aldrin prepared to enter Eagle for the first time on their third day in space, Collins powered up Columbia's colour television camera and gave mission control, and anyone else watching, a TV show. Collins had got the camera working early, an hour or so in advance of a planned TV show, causing technicians to hustle to get the signal from California to Houston by landline and convert it to colour. The crew had earlier pressurised the LM cabin with air from the command module. When the pressures on both sides of the forward hatch had equalised, the hatch could be removed and the tunnel cleared of the docking equipment: first the probe, then the drogue. Once Armstrong got the probe out, he inspected its tip for signs of damage from the impact with the drogue during Collins's docking. ''Roger,'' replied Duke. ''We're really getting a great picture here, 11. With a 12-foot cable, we estimate you should have about 5 to 6 feet excess when you get the camera into the LM.'' During their training, they had discovered that they were to be supplied with a short cable that would not have reached into the LM, and arranged a longer substitute. With the tunnel cleared, one of the crew could read off the docking roll angle. ''We went up in the tunnel checking the roll angle, Charlie, and it's 2.05 degrees,'' called Collins. ''And that's a plus,'' he added. When he had docked the two spacecraft two days earlier, he used visual aids to help him to line up. In a perfect docking, the angle between the coordinate systems of the two vehicles would be 60 degrees. Any slight deviation from this was read off a calibrated scale in the tunnel between the two craft. The measurement was later factored into calculations when the orientation of the CSM's guidance platform was transferred to the LM. Spaceflight has a knack of taking what, on Earth, appears like a trivial problem and making its possible consequences very profound. First, the shards of glass did not fall to the floor. They were floating about the cabin, moved around by any passing air current, which meant that they could easily be breathed in by the crew. There was little experience of what would happen when sharp glass shards entered a human's respiratory system and they certainly did not want them entering the eye. Second, the tapemeter was an important instrument. It told the commander how far away something was - be it the ground during a landing, or the CSM during rendezvous - and it told him how fast the object was approaching or departing. Its manufacturers had filled it with helium gas to minimise corrosion of its parts, and sealed it at sea-level pressure. Immediately Scott reported the broken glass, NASA realised that this gas had been lost, and arranged to have an identical instrument tested to see how well it operated with an oxygen atmosphere at one third of its design pressure, and indeed in a vacuum (as it would experience while the LM was depressurised during the moonwalks). 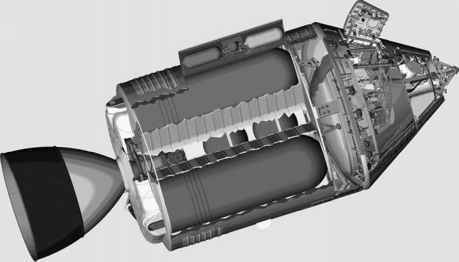 Mechanical devices can suffer from various problems when operated in a vacuum. Lubricants can evaporate and close-fitting surfaces can stick together without a film of air to separate them. This is known as vacuum welding. As Scott had suggested, sticky tape and their vacuum cleaner dealt successfully with the glass, and testing showed no problems with operating the tapemeter in alternative atmospheres. By having the crew enter the LM a day early, NASA had given themselves an extra day to examine problems such as these. While they were in the LM, some of its systems were powered up to allow mission control to examine the telemetry coming from them. As an aid for this, their checklists included diagrams of the spacecraft's circuit breaker panels. Those breakers that had to be closed were black, the others white, making it easier for the LMP to match the patterns and know he had operated the correct breakers. The LM's power budget was tight, and no one wanted to deplete the batteries more than necessary. Just as the backup CMP had checked all the command module switches and knobs prior to launch, this was an opportunity for the LMP to check that everything was properly set for landing day - it was a 'get-ahead' exercise. Readings were taken on the pressures in their emergency oxygen supplies and the voltages of the LM's batteries. Checks were also made of the communications systems. Could they talk with mission control using S-band? Could they talk to the CSM using VHF? Was spacecraft telemetry getting through to mission control along with the data from their biomedical sensors? Checks complete, the LM crew powered the spacecraft down and returned to the CSM, closing the hatch behind them in case a meteor strike to the lander dumped its atmosphere. On later flights, a second check was made of the LM on the third day.